11th November 2018 marks the centenary of the end of World War I, the war that changed the face of the world and scarred an entire generation. Its significance cannot be underestimated, its fallout massive. Mechanisation, airpower, chemical weapons and ideology all led to a devastating conflict that spanned the globe, from the banks of the Somme to the arid deserts of the middle east, from the African continent to the high seas of the Pacific. WWI led to the collapse of empires, the creation of brutal new methods of waging war, and sew the seeds of adversity that would lead to the ascension of Adolf Hitler and the Nazi Party. The world order before 1914 had been one of relative stability and peace across the European continent. Following the defeat of Napoleon’s France at Waterloo in 1815, the European powers had agreed that to prevent future wars from occurring a system must be adopted where powers could resolve any issues via diplomacy and without resorting to armed conflict. The system that developed became known as the Concert of Europe, and through conferences every few years Victorian Europe proved to be one of cooperation and innovation. The Industrial Revolution was booming and living standards were improving, to most the idea of a great conflict that would devastate the current order was untenable. However, the revolutions that swept Europe in 1848 saw the demise of the Concert, and the common goals of the Great Powers were replaced by political upheaval and economic rivalry. A series of localised wars throughout the latter half of the century confirmed that a much bigger conflict was looming on the continent. There are many reasons why the conflict began, imperialism, nationalism, militarism and a complex web of alliances all led to the war that was supposed to “end all wars.” Here I offer what I believe to be the most important catalysts in the plunge into war. The unification of the German states in 1871 under the watchful eye of Otto von Bismarck was to set Europe on a collision course. Before 1871 the German people had been divided between a number of petty states and kingdoms, the most powerful of these being the militaristic Prussia. Following a series of wars against Austria and France, the Prussians were able to unify the German people for the first time in history under one flag and one Kaiser. This new Germany looked at Britain with envious eyes, jealous of her imperial might and her unmatched naval supremacy. Germany began a program of shipbuilding and a naval arms race ensued, and while German admirals never expected to be able to defeat the Royal Navy in a decisive battle, they knew that having a large navy in being would force Britain to make diplomatic concessions. From 1905 onwards Britain had developed plans for blockading the German coast, with First Sea Lord Admiral John Fisher commenting that Germany was the only “proveable enemy.” It became British policy that the Royal Navy should always seek to have a force twice as powerful as their German counterpart. 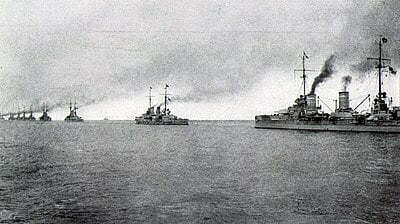 By the start of the war, Britain had 49 surface battleships, compared to Germany’s 29. In the year leading up to the outbreak of war, German military spending had increased by a staggering 73%. Several historians have argued that this arms race was a major factor in leading Europe into war in 1914. Tensions were bolstered in 1884 as Germany made attempts to acquire imperial possessions with the “Scramble for Africa” and in the far east, bringing her into dispute with Britain and France as she looked for her “place in the sun.” By the outbreak of war in 1914, Germany had the third largest colonial empire in Europe and posed a direct threat to British interests. Due to this perceived aggression, Germany faced isolation on the international stage. This was an important reason for the outbreak of war as it left Germany with no option to ally more closely with its neighbour Austria-Hungary. When Austria-Hungary declared war on Serbia following the assassination of Archduke Franz Ferdinand in July 1914, Germany offered a “blank check” to the Austro-Hungarians, bringing into play the complicated web of alliances that had formed over previous decades. The Serbian nationalist group Black Hand were responsible for the assassination of the Archduke. Black Hand was a group made up of Serbian military officers, as well as hundreds of ordinary civilians, whose goal was to unite all Serb inhabited territories under one Serbia and expel what they viewed as an occupying Austro-Hungarian regime. When it was heard that the Archduke was to be visiting Sarajevo (In present-day Bosnia) a cell of three assassins was sent to to the city to intercept him with the goal of ridding themselves of what they viewed as a primary obstacle to their revolution. The assassins first attempt at the Archduke’s life failed when the grenade was thrown at his car missed, detonating near the car behind, severely injuring several of the Archduke’s entourage. Later on in the day, after a brief respite the Archduke insisted on visiting those who had been injured in the blast – however no one had told his drivers that the day’s itinerary had changed and when the mistake was discovered, they attempted to turn around from the direction they were travelling which caused the convoy to stall in the middle of a busy Sarajevo street. By sheer coincidence, another member of the cell sent to assassinate the Archduke, 19-year-old Gavrilo Princip, was sat in a cafe across the street. Upon noticing the convoy he seized on his opportunity, quickly going over to the royal car and shooting the Archduke and his wife. 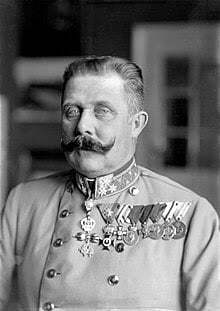 Franz Ferdinand succumbed to the wound in his neck within minutes, while his wife Sophie died en route to the hospital. Little could Gavrilo Princip know the chain of events he had set in motion, his two shots into the royal car of Archduke Franz Ferdinand would start a war that by its end would have claimed the lives of an estimated 16 million people.